The lake is actually called Walter F. George Reservoir. But it is better known as Lake Eufaula, due to its location near the town of Eufaula, Alabama. Lake Eufaula is situated on the Alabama-Georgia line. To the north of Lake Eufaula at the lakes headwaters is the Eagle Phenix Dam, located just south of the city of Columbus, Georgia. This huge 45,181 acre man made lake was impounded over 44 years ago. The Army Corps of Engineers began construction on Walter F. George dam (over 2 miles in length and 114 feet tall) in 1956, thus backing up the waters of the Chattahoochee River System. This created a huge, man made impoundment as the dam was completed 7 years later in 1963. Lake Eufaula then featured over 640 miles of a newly created shoreline, a lake that stretches north of Walter F. George dam for 87 nautical miles. Lake Eufaula’s headwaters start at Eagle Phenix Dam. Its twisting and winding waters stretch south for over 40 miles before taking on a more lake like appearance. The upper end of this huge impoundment actually looks more like the old original Chattahoochee River, than a lake. From the lakes headwaters all the way south to Florence Marina, features very little back waters or major feeder creeks for anglers to explore. Its mostly main river fishing. Just north above Lakepoint Resort (situated in the mouth of Cowikee Creek) are some feeder creeks such as Turner Creek, Little Barbour Creek, Rood Creek, Wylaunee Creek, Bustahatchee Creek and Soapstone Creek. All of these small feeder creeks are worth the efforts of both crappie anglers and bass anglers, to do a little exploring this spring. Highway 431 south runs parallel of Lake Eufaula on the Alabama side of the lake. It crosses over most of the lakes major feeder creeks such as Cowikee Creek, one of the lakes major suppliers of incoming water. Cowikee Creek is a huge feeder creek that branches off into a south fork, middle fork and north fork. There are many bass, perhaps thousands, that are released each week in Cowikee Creek during major bass tournaments that are held here throughout the spring months. A huge population of both male and female bass, recently released in dozens of major bass tournaments that take place out of Lakepoint Resort boat launch, can be found carrying on their rituals of spawning during the spring months of April and May all throughout Cowikee Creek. Lake Eufaula is situated on the Alabama and Georgia state line and honors both state fishing licenses. However, if anglers are planning on fishing the lake looking for bass and crappie in the lakes incoming feeder creeks, the Alabama side of the lake is best. Below Cowikee Creek on the west side of the lake are many major feeder creeks to explore this spring. Old Town Creek park has many pockets, small cuts and grassy flats to fish during the months of April and May. Just below there is the mouth of Chewalla Creek near the Highway 82 bridge that crosses the lake. Chewalla Creek is a small creek, but features fairly deep water of 20-25 feet around its bridges and rocky rip-rap banks found midways of the creek. Besides feeder creeks there is a lot of very fishy looking cover (both natural and man made) to explore in this mid lake area. As Lake Eufaula is returned to full pool in April, there will be new growing aquatic weeds clearly visible all throughout these main lake flats and small pockets. There are also two bridges that span this mid lake area. One bridge is the Hwy. 83 bridge. Just below it is the Central Railroad bridge. Man made rip-rap rocks line both of these bridges for miles and these rocks hold heat throughout the day as surrounding waters warm. They also hold bass and crappie in April and May. There are also many sunken brush piles planted by Alabama Power Company. These are clearly evident with buoys marked as fish attractors. One very small feeder creek Tobannee Creek, can be found just below the Railroad bridge on the Georgia side of the lake. As the lake widens, so do the feeder creeks, as you head south from these two bridge crossings to the lakes lower end. April shows some of Lake Eufaula’s largemouth bass bedding, while other previously early spawners are already coming off the beds in a post spawn mode in early May. 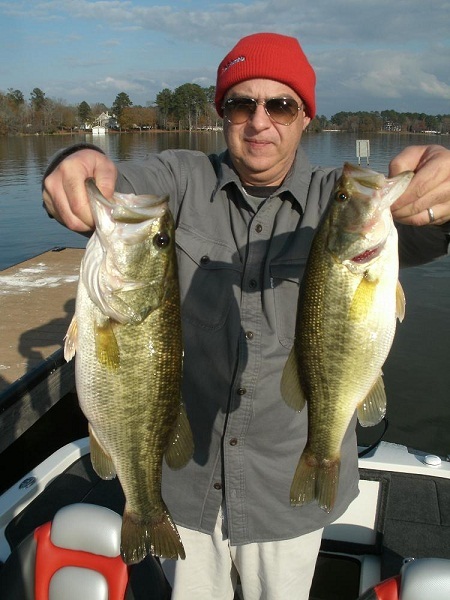 Barbour Creek, Cheneyhatchee Creek, White Oak Creek and Sandy Creek (all on the Alabama side of the lake) are excellent choices for targeting both largemouth bass and crappie in April and May. Just below White Oak Creek on the Alabama side of the lake is Thomas Mill Creek and Hardridge Creek. Both are small creeks that are not fished as much as mid lake creeks in spring. Just across the lake from Thomas Mill Creek (on the Georgia side of Lake Eufaula) is one of the lakes major suppliers of incoming water. Pataula Creek features loads of incoming nutrients, various types of aquatic weeds, brush piles, stumps rows, rip-rap rocks around a bridge and stands of Cyprus trees. Heavy spring rains can muddy up Pataula Creek in April. Just below Pataula Creek (on the Georgia side of the lake) is Sandy Branch, Sandy Creek and many small, inobscure pockets. All of these lower lake, shallow water spawning areas show less fishing pressure, due to more angling attention in the mid lake portion of Lake Eufaula. Both sides of the lower part of Lake Eufaula (near the dam), can be loaded with schools of virtually unmolested, late spawning bass and some post spawn bass in April and May. Walter F. George lock and dam on the lakes lower end is a dam that is 13,585 feet in length. There are slight irregularities found along these man made rip-rap rocks that line the dam on both the Alabama side of the lake and the Georgia side of the lake. Some of these post spawn, fish holding spots on the dam are visible such as the miles of man made rip-rap rocks. Some places, holding both bass and crappie, are hidden below the waters surface near the face of the dam, along these miles of rocks. Places worth exploring (with some map study and depth finder use), are hidden underwater rock points, underwater brush piles, washed in logs, trees or other wooden debris, or places where bigger rocks exist next to smaller rip-rap rocks. There is a spot near the dam discharge, where the old original Chattahoochee River channel swings in close to the rocks, found on the Alabama side of the lake. As bass come off the beds in May and they begin to bunch up in huge schools, they begin to travel along these rocks and underwater irregularities. They are here for one reason, to eat. They are mostly feeding on minnows, baitfish, small bream, worms and crayfish found hidden here along the dam. Anglers can fish the rocks for hours, often without a bite, then suddenly a school of fish can move up and they can be catching them on every cast. Staying on the move fishing in close to the rocks along the dam or just anchoring down out from the rocks on the dam, shows patient anglers will eventually encounter fish. It does takes lots of patience while fishing such a huge often intimidating man made dam to wait for the fish to move in. Lures such as worms, lizards, crayfish imitations, tube baits and creature baits rigged Texas rigged are great fish locators. Bring plenty of lures, sinkers and hooks for the rocks do have a way of eating them up. Shallow to deep diving crankbaits, suspending and floating hard bodied jerkbaits and rattling lipless lures, are also good for covering water fast in April and May while fishing for bass along these rocks. 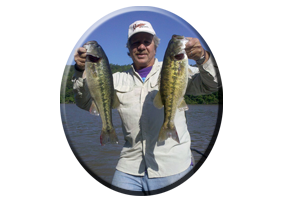 Even fishing in close and running your lures down parallel down the rip-rap rocks show such lures as topwaters and spinnerbaits fool some big, Eufaula bass. Lake Eufaula has changed tremendously over the last 40 plus years since its impoundment in 1963. Gone are the days of anglers catching over 100 bass in a days time. 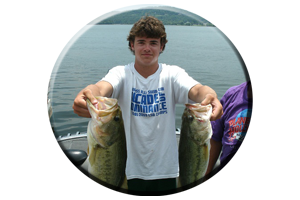 Although big trophy bass are still taken each spring season, you do not hear of as many ten pound plus bass being caught, like years ago when a ten pound bass was very common. 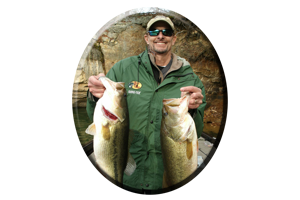 They do exist and each spring season some fortunate angler does hook into one, do battle with one, and if they are very lucky, land one of these true, tackle testing monster largemouth bass. During April and May most Eufaula bass are hungry and they can be very aggressive during cloudy periods or on rainy days, usually following a warming trend. Topwater lures are at their best in late April on into May. Buzzbaits, walking type topwaters, topwaters featuring propellers or popping type topwaters, are all chosen favorites during spring for Eufaula’s big, largemouth bass. With the recent introduction of various types of aquatic weeds such as millfoil, hydrilla and Lilly pads, weedless lures have become very necessary to avoid lure hang-ups, losing expensive lures and having to deal with frustrating weeds grabbing the lures hooks. Weedless topwaters such a frog and rat imitations can be deadly on Eufaula’s weed infested bass. 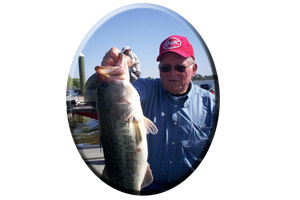 Heavy line of 20 pound test and stought rods and reels are recommended for aiding an angler in horsing some big bass out of Eufaula’s thick weed and wood cover. 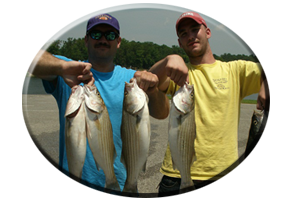 Other weedless lures may be fished on 14-17 pound line such as floating worms and lizards, soft jerkbaits, spinnerbaits, weedless spoons, and swimming lures such jig combos, tube baits, worms and crayfish imitations fishing in among the weeds or along weed edges. Even small finesse worms fished on jig heads with light tackle outfits have become necessary. Especially on bright, sunny bluebird days when fishing really slows down or on days like weekends when fishing pressure is very evident. In certain areas of the lake in order to get these finicky fish to bite, this often calls for the use of smaller offerings. Crappie fishing on Lake Eufaula is great during the spring months of April and May. Anglers can load up the freezer with some nice fillets of crappie (some that reach 2-3 pounds), of which usually just involves anglers fishing along bridges, around piers, laydown trees, along weedlines and along rocks found on causeways and the dam with jigs and minnows. Give Lake Eufaula a try this Spring and discover some of the best bass and crappie fishing to be had in the south…before the dog days of summer arrive. Please practice Catch and Release this spring season and keep only what you need. The future of fishing depends on you!